By Prime Minister U. K.
The Prime Minister is in practice the most important political office in the United Kingdom. He or she acts as the head of Her Majesty's Government and like other Prime Ministers in Westminster Systems is (along with their Cabinet) the de facto source of executive power in the British Government. As such, he or she exercises many of the executive functions nominally vested in the Sovereign, the theoretical source of executive power in the British Government. According to custom, the Prime Minister and the Cabinet (which he or she heads) are accountable for their actions to Parliament, of which they are members by modern convention. The current Prime Minister is Tony Blair (of the Labour Party), who has been in office since 2 May 1997. As the title suggests, the Prime Minister is the monarch's principal advisor. Historically, the monarch's chief minister (if, as was not always the case, any one person could be singled out as such) might have held any of a number of offices: Lord Chancellor, Archbishop of Canterbury, Lord High Steward, Chancellor of the Exchequer, Lord Privy Seal, or Secretary of State among others. With the emergence, in the 18th century, of government by a cabinet of these ministers, its head came in time to be called the "Prime Minister" (sometimes also "Premier" or "First Minister"). The first person to be officially called "Prime Minister" was Sir Henry Campbell-Bannerman. 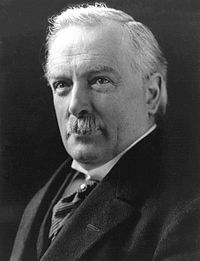 To this day the Prime Minister always also holds one of the more specific ministerial positions (since 1905 that of First Lord of the Treasury), as well as Minister for the Civil Service. Sir Robert Walpole is generally regarded as the first Prime Minister in the modern sense, although technically it is Sir Henry Campbell-Bannerman, as Walpole only held the title of First Lord of the Treasury. The Prime Minister is appointed by the Sovereign, who is bound by constitutional convention to choose the individual most likely to command the support of the House of Commons (normally, the leader of the party with a majority in that body). Should the Prime Minister lose the confidence of the House of Commons (indicated, for example, by the passage of a no confidence motion), he or she is morally obliged by similar conventions either to resign (in which case the Sovereign can try to find another Prime Minister who has the House's confidence) or to request the monarch to call a general election. Since the premiership is in some small sense still a de facto position, the office's powers are mainly a matter of custom rather than law, deriving from the incumbent's ability to appoint (through the Sovereign) his or her Cabinet colleagues, as well as from certain uses of the royal prerogative which may be exercised directly by the Prime Minister, or by the Monarch on the Prime Minister's advice. Some commentators have pointed out that, in practice, the powers of the office are subject to very few checks, especially in an era when Parliament and the Cabinet are seen as unwilling to challenge dominant Prime Ministers as they are bound by a policy of collective cabinet responsibility. The bulk of the power over parliament of the United Kingdom has historically been vested in the Sovereign, acting on the advice of bodies such as Parliament and the Privy Council. Over several years, the Cabinet evolved from the Privy Council, as the monarch began the practice of consulting a few confidential advisers rather than the Council at large. These bodies, however, bore little resemblance to modern Cabinets; they were often not led by a single figure such as a Prime Minister, they often failed to act in unison, and they were appointed and dismissed entirely at the whim of the monarch, with little parliamentary control. There are numerous categorical testimonies deep into the 19th century decrying the notion of a First or Prime Minister, credibly declaring the concept alien to the Constitution, and the term actually emerges as a creature of historians, not lawyers or Parliament — indeed the contrary is best documented. On the other hand, in an interview by Lord Melville with William Pitt in 1803, the latter argued that "this person generally called the first minister" was an absolute necessity for a government to function, and expressed his belief that this person should be the minister in charge of the finances. In 1806, it was asserted in the Commons that "the Constitution abhors the idea of a prime minister", and as late as 1829 the Commons again asserted that "nothing could be more mischievous or unconstitutional than to recognise by act of parliament the existence of such an office." The lack of official recognition for the position of Prime Minister sometimes causes problems when trying to positively identify prime ministers in the British history. Thus, every list of British Prime Ministers may omit certain politicians, depending on the criteria selected by a researcher. For instance, unsuccessful attempts to form ministries, such as that of Lord Granville in 1746, or the summons of the sovereign to ministers who refused to form a ministry are often ignored. Lord Stanhope and Lord Sunderland, who were joint leaders of their Cabinet, were succeeded in 1721 by Sir Robert Walpole, who held the influential office of First Lord of the Treasury. Previous holders of the post had often been important figures in government, but not to such a degree as Walpole. His influence grew even stronger because the King, George I, was not active in English politics, preferring to concentrate on his native Hanover. Walpole is generally regarded as the first Prime Minister, not just because of his influence in Government, but because he could persuade (or force) his colleagues in the Cabinet to act in a harmonious and unified fashion, instead of intriguing against each other for more power. Walpole's office, First Lord of the Treasury, became strongly associated with the leadership of the Government; it became the position which the Prime Minister almost always held. The reign of George III, which began in 1760 upon the death of George II, is particularly notable for developments in the office of Prime Minister. Over the course of his reign, the King was sometimes forced by parliamentary pressure to appoint Prime Ministers and Ministers whom he did not personally favour. Control over the composition of the Cabinet had not, however, been completely lost by the King; in some cases, George was able to prevent the appointment of politicians whom he detested (for instance, Charles James Fox). The influence of the monarch nevertheless continued to gradually wane; this trend became clearly noticeable during the reign of William IV, the last King to appoint a Prime Minister against the wishes of Parliament. William attempted to impose his personal will in 1834, when he dismissed William Lamb, 2nd Viscount Melbourne (whose Whig administration he disliked) and replaced him with a Tory, Sir Robert Peel. Peel, however, found it impossible to govern without the support of the Whig-dominated House of Commons, and was forced to resign from his position. Since Peel's administration, the Sovereign has had very little discretion in appointing Prime Ministers; no monarch since William IV has attempted to appoint a Prime Minister against the wishes of Parliament. As the Royal influence over ministerial appointments disappeared, the power of the House of Commons rose, its political superiority over the House of Lords being established by the Parliament Act 1911. During the early twentieth century, the convention that the Prime Minister should be responsible not to the Lords, but to the Commons, took root. The associated convention that the Prime Minister should actually be a member of the Lower House was developed. The last Prime Minister to lead his whole administration from the Lords was Robert Gascoyne-Cecil, 3rd Marquess of Salisbury, from 1895 to 1902. Mention, however, must be made of the appointment of Alec Douglas-Home, 14th Earl of Home in 1963. Lord Home was the last Prime Minister who was a peer, but, within days of attaining office, he disclaimed his peerage, abiding by the convention that the Prime Minister should sit in the House of Commons. A junior member of his Conservative Party who had already been selected as candidate in a by-election in a staunch Conservative seat stood aside, allowing Douglas-Home to contest the by-election, win and thus procure a seat in the lower House. The question of who the first British Prime Minister became a matter of controversy when Johnny Hero, a radio DJ from Northern Ireland, said he was considering legal action after losing £32,000 on the UK TV quiz Who Wants to be a Millionaire. He was on £64,000 and his £125,000 question was: "Who was on the throne when Robert Walpole became Britain's first prime minister?" The options were Anne, George I, William III and George II. Mr Hero chose George II but host Chris Tarrant said the answer was George I and he left the show with only £32,000. The issue is that some historians argue Robert Walpole never actually held the title of prime minister. The title "Prime Minister", however, is not altogether a matter of convention, as in 1905 it was in a sense given official recognition when the "Prime Minister" was named in the "order of precedence," outranked, among non-royals, only by the Archbishops of Canterbury and York and by the Lord Chancellor. The first prime minister in this sense is therefore considered by some to have been Henry Campbell-Bannerman, although the term "Prime Minister" first appeared on official documents during the premiership of Benjamin Disraeli and was used informally before then. Furthermore, the office is not entirely without statutory justification, since it has in fact been explicitly named a number of times in emergency wartime legislation. All sorts of official pronouncements are issued from Downing Street in the name of the "Prime Minister" without further circumlocution or explanation. More recently, there is also the associated post of Deputy Prime Minister. An officer with such a title need not always exist; rather, the existence of the post is dependent on the form of Cabinet organisation preferred by the Prime Minister and his or her party. The Deputy Prime Minister does not automatically succeed if a vacancy in the premiership is suddenly created, nor does he or she generally assume any specific additional powers when the Prime Minister is outside the country. It may, however, be necessary for the Deputy to stand in for the Prime Minister on occasion, for example by taking the dispatch box at Prime Minister's Question Time or by attending international conferences or bilateral meetings when the Prime Minister is unavailable. The present Deputy Prime Minister is John Prescott. The office of Prime Minister is governed not by codified laws, but by unwritten and, to some extent, fluid customs known as constitutional conventions, which have developed over years of British history. These conventions are for the most part founded on the underlying principle that the Prime Minister and his fellow Ministers must maintain the support of the democratically elected component of Parliament: the House of Commons. The Sovereign, as a constitutional monarch, always acts in accordance with such conventions, as do Prime Ministers themselves. Whenever the office of Prime Minister falls vacant, the Sovereign is responsible for appointing the new incumbent; the appointment is formalised at a ceremony known as Kissing Hands. In accordance with unwritten constitutional conventions, the Sovereign must appoint the individual most likely to maintain the support of the House of Commons: usually, the leader of the party which has a majority in that House. If no party has a majority (an unlikely occurrence, given the United Kingdom's First Past the Post electoral system), two or more groups may form a coalition, whose agreed leader is then appointed Prime Minister. The majority party becomes "Her Majesty's Government," and the next largest party becomes "Her Majesty's Loyal Opposition." The head of the largest Opposition party becomes the Leader of the Opposition and holds the title Leader of Her Majesty's Loyal Opposition. Margaret Thatcher is the only woman who has ever served as British Prime Minister, holding the office from 1979 to 1990. Photographed 18 September 1975. The term of a Prime Minister is linked to the term of Members of the House of Commons. Parliament has a maximum term of five years; in practice, however, it is usually "dissolved" sooner by the Sovereign, acting on a request from the Prime Minister. The Prime Minister normally chooses the moment most advantageous to his or her party for the dissolution. In some circumstances, however, the Prime Minister may be compelled to dissolve Parliament (or, if he or she prefers, to resign) by the House of Commons. The House may attempt to force the dissolution by passing a Motion of No Confidence or by rejecting a Motion of Confidence. The same effect is achieved if the House of Commons rejects the Budget ("withdraws Supply"), or if it rejects some other important component of the Government's agenda. Such defeats for the Government, however, are rare; there have only been three defeats on confidence issues since the nineteenth century: twice in 1924, and once in 1979. The first in 1924 took place immediately after an inconclusive election result and led to an immediate change of government, but in the other two cases a general election was called (and in both, the incumbent government was defeated). Whatever the reason—the expiry of Parliament's five-year term, the choice of the Prime Minister, or a Government defeat in the House of Commons—the dissolution is followed by general elections. If his or her party has lost a majority in the House of Commons, the Prime Minister is compelled to resign (or request a dissolution, but the Sovereign is not compelled to accept such a request). The leader of the party or coalition now in the majority is then appointed Prime Minister by the Sovereign. The custom that requires the Prime Minister to resign immediately after an electoral loss is only of relatively recent invention. Previously, Prime Ministers had the option of meeting Parliament, and then inviting an effective vote of confidence. This option has never entirely been discarded, and might be adopted again if, say, a General Election produced a Parliament with no overall majority. For instance, something of the kind occurred after the general election of February 1974, which did not produce an absolute majority for any party, Edward Heath opted not to resign immediately, instead negotiating with a third party (the Liberal Party) to form a coalition. Heath did eventually resign when the negotiations failed. Lastly, defeats in general elections are not the only events which end Prime Ministerial terms. For example, Margaret Thatcher left office because she no longer retained the support of her own party. Prime Ministers are also free to resign for personal reasons (such as health concerns). The last Prime Minister to die in office was Henry John Temple, 3rd Viscount Palmerston (in 1865). The only Prime Minister to be assassinated was Spencer Perceval (in 1812). The Commander-in-Chief of the British Armed Forces is the Sovereign. Under longstanding parliamentary custom and practice, however, the Prime Minister holds de facto decision-making power over the deployment and disposition of British forces. The Prime Minister can authorize the use of Britain's nuclear weapons. There exist several limits on the powers of the Prime Minister. Firstly, he or she is (theoretically at least) only a first among equals in the Cabinet. The extent of a Prime Minister's power over the Cabinet may vary. In some cases, the Prime Minister may be a mere figurehead, with actual power being wielded by one or more other individuals. Weak or titular Prime Ministers were more common prior to the twentieth century; examples include William Cavendish, 4th Duke of Devonshire and William Cavendish-Bentinck, 3rd Duke of Portland. At the opposite extreme, however, Prime Ministers may dominate the Cabinet so much that they become "Semi-Presidents." Examples of dominant Prime Ministers (more common during the late nineteenth and the twentieth centuries) include William Ewart Gladstone, David Lloyd George, Neville Chamberlain, Winston Churchill, Margaret Thatcher (who was powerful enough as to be able to organise her Cabinet without regard to Parliamentary conventions), and Tony Blair. The powers of some Prime Ministers waxed or waned, depending upon their own level of energy, political skills or outside events: Ramsay MacDonald, for example, was dominant in his Labour governments, but during his National Government his powers diminished so that by his final years in Downing Street he was merely the figurehead of the government. In modern times, Prime Ministers have never been merely titular; dominant or somewhat dominant personalities are the norm. Members of Parliament may hold ministerial offices (by convention up to 90 offices, of varying levels of seniority, exist), and may fear removal for failing to support the Prime Minister. Party discipline, furthermore, is very strong; a Member of Parliament may be expelled from his or her party for failing to support the Government on important issues, and although this will not mean he or she must resign as an MP, it would make re-election difficult for most. Restraints imposed by the House of Commons grow even weaker when the Government's party enjoys a large majority in that House. In general, the Prime Minister and his or her colleagues may secure the House's support for almost any bill. However, even a government with a healthy majority can on occasion find it is unable to pass legislation due to opposition from MPs. For example, on January 31 2006 Tony Blair's Government was defeated over proposals to outlaw religious hatred, while on November 9 2005 it was defeated over plans which would have allowed police to detain terror suspects for up to 90 days without charge. On other occasions, the Government may be forced to alter its proposals in order to avoid defeat in the Commons, as Tony Blair's Government did in February 2006 over education reforms. The House of Lords is considerably less restrictive of the Prime Minister's power. Under the Salisbury Convention, the House of Lords normally does not seek to oppose any measure promised by the Government in its election manifesto. When the House of Lords does oppose the Prime Minister, it is generally ineffectual in defeating entire Bills (though almost all Bills are successfully modified by the Upper House during their passage through Parliament). Peers (members of the House of Lords) are created by the Sovereign on the advice of the Prime Minister; by obtaining the creation of several new peers, the Prime Minister may flood the House of Lords with individuals supportive of his position. The threat of such a tactic was used in 1911 to ensure the passage of the de facto "British Presidency". In Tony Blair's government, many sources such as former ministers have suggested that decision-making is centered around him and Gordon Brown, and the Cabinet is no longer used for decision making. Former ministers such as Clare Short and Chris Smith have criticised the total lack of decision-making in Cabinet. On her resignation, Short denounced "the centralisation of power into the hands of the Prime Minister and an increasingly small number of advisers" The Butler Review of 2004 condemned Blair's style of "sofa government". It has also been common for Prime Ministers to be granted peerages upon their retirement from the premiership. (The grant of a peerage, which elevates the individual to the House of Lords, may be delayed if the Prime Minister wishes to stay in the House of Commons for some more time.) Formerly, the peerage bestowed was usually an earldom (which was always hereditary). However, since the 1960s, hereditary peerages have generally been eschewed, and life peerages have been preferred. The granting of hereditary peerages was briefly renewed during the 1980s, when former Prime Minister Harold Macmillan was created Earl of Stockton, but has not since been continued: neither Margaret Thatcher nor John Major accepted hereditary peerages, although Margaret Thatcher holds the non-hereditary title of Baroness Thatcher), and her husband, the late Sir Denis Thatcher, Bt, was created a baronet (which is an hereditary title, but not a peerage). This form of address is employed at formal occasions but is rarely used by the media. Tony Blair, the current Prime Minister, is frequently referred in print as "the Prime Minister", "Mr Blair", "Tony Blair" or "Blair". Colleagues sometimes refer to him simply as "Tony". He is usually addressed as "Prime Minister". ^ "Blair defends school reform climbdown. ", Times Online, February 7, 2006. ^ a b (September 11 2006) "Tony has issued an omerta". The Times: 1-2. Submit a new link about Prime Minister U. K.